There are countless presidential scandals in U.S. history, but very few of them have resulted in resignation or impeachment — which is precisely why MSNBC host Rachel Maddow was drawn to the story of Spiro Agnew, Richard Nixon's first vice president, who resigned in 1973. Maddow notes there are many misconceptions concerning the former vice president — including the notion that his "big sin" centered on taxes. "When I tried to sort of thumbnail in my mind what happened in the Agnew resignation, everything I thought about it was wrong," she says. "I had assumed that it was a Watergate-adjacent scandal, that the FBI was looking into Watergate-related crimes and they stumbled upon something in Spiro Agnew's taxes. ... All of those things were completely wrong." Maddow and her former producer Mike Yarvitz created the podcast Bag Man to revisit Agnew's story. Though his resignation was officially linked to tax evasion, they say that Agnew had engaged in bribery that dated to the early 1960s, when, as Baltimore County executive, he demanded kickbacks in exchange for local engineering or architecture contracts. He continued the practice even after being elected governor of Maryland in 1967 and then vice president in 1969. "He ... started that scheme in local politics and then he carried it right into the White House," Yarvitz says. "The men who were sort of streaming into his office at the White House were paying him money for contracts they had gotten in Maryland, and in some cases, he was trying to influence the awarding of federal contracts." After the Justice Department began looking into Agnew's dealings, the vice president tried to pressure the U.S. attorney in charge of the case to halt the investigation — a response Maddow likens to the current administration's reaction to special counsel Robert Mueller's investigation into Russian interference in the 2016 election and possible ties to the Trump campaign. "The parallels with what was going on in the Nixon and Agnew administration 45 years ago to the efforts by the Trump administration right now ... is uncanny," Maddow says. "The Agnew story is really helpful to understanding the way the system works when it confronts bad behavior by people in high office. We are capable of dealing with that as a country in a way that makes us proud of the people who are in public office who are dealing with it." Mike Yarvitz: Essentially, it was a scheme that he had concocted when he was Baltimore County executive, where he realized that he had the power to award some local contracts for engineering and architecture and he could singlehandedly decide who got the contract. And what he put together was a scheme that predated his time in that office, but he would arrange with these local contractors, engineers and architects that they would get the contract and in return they would kick back to him something on the order of 3 to 5 percent of whatever they were making off of that contract. And these were kickbacks that were delivered to him in cash, often in an envelope that was just brought to him and handed to him directly. In many cases he used a "bag man" as part of this scheme. And it was a scheme that he started when he was Baltimore County executive that he then continued when he was governor of Maryland. Again, he used the state roads commissioner when he was governor, and basically it was a kickback scheme, it was a bribery and extortion scheme in which if you wanted a government contract in Maryland you would have to kick back money to Spiro Agnew. And it was brazen, and it was delivered in cash. Yarvitz: When he was vice president he didn't have as much power to award contracts — that's a federal process. But when he became vice president he was still taking money for contracts that had ripened; essentially, that he had given out in Maryland as governor. So the men who were sort of streaming into his office at the White House were paying him money for contracts they had gotten in Maryland. And, in some cases, he was trying to influence the awarding of federal contracts — and he was successful in a number of cases at steering federal contracts to these businessmen in Maryland who wanted these jobs. This was an obstruction effort that the prosecutors at the time didn't know about, and one of the surprising and amazing things to us as we were putting together this podcast was that even 45 years later they weren't aware of it. So their reaction now, to hearing about this effort to obstruct and end their investigation, it was a revelatory moment in putting together this podcast, which is that they were completely unaware, and the reason that they were is because ultimately the obstruction effort didn't work. George Beall, their boss, the U.S. attorney, was getting that pressure from his brother and he shut [the pressure] down. He didn't let it get to his federal prosecutors who were working on the case. Rachel Maddow: I mean, theoretically, what that could have resulted in is Nixon leaving office or being forced from office because of the criminal scandal that was Watergate, him being succeeded immediately by a vice president who was under a completely separate criminal investigation, who was then also forced from office, relatively quickly, because of that same sort of criminal liability that his predecessor had faced — at that point would [a President Agnew] have even had a chance to nominate a new vice president who would then be confirmed by the Senate, who would then succeed him? Would you end up with the Democratic speaker of the House ascending to the presidency because all of these dominoes were falling too quickly for the line of succession to be restored fully? I mean, the prospect of the chaos at the top of the federal government was just unparalleled. Maddow: It was Elliot Richardson, the attorney general, who decided that the priority could not be individual justice for Spiro Agnew, the criminal. The priority could not be Agnew being put in jail. It was Richardson who decided the priority for the country had to be Agnew out of the line of succession. That the most important and in fact the unitary goal of this prosecution, of this entire revelation these prosecutors had come to about Agnew, the unitary goal of it had to be his removal from office. He had to no longer be vice president, because that was more important to the country than whether or not he faced individual justice. Maddow: The Office of Legal Counsel ... produced a sort of strange memo which said, "Well, the president can't be indicted, but the vice president can." Sort of an odd duck, that memo. But on the basis of that opinion, the attorney general and these prosecutors went to Agnew's legal team and said, "Hey, we can indict you and we intend to, and what do you have to trade for that?" And those negotiations went on for a long time, and they were complex and important but ultimately the deal that was reached was that Agnew would only have to plead no contest to one count. He wouldn't do any jail time, but he would have to resign immediately. ... He pled to tax evasion, but he didn't plead guilty; he pled no contest. Amy Salit and Thea Chaloner produced and edited the audio of this interview. Bridget Bentz, Molly Seavy-Nesper and Dana Farrington adapted it for the Web. This is FRESH AIR. I'm Terry Gross. My guests, Rachel Maddow and Mike Yarvitz, have collaborated on a podcast called Bag Man that tells the forgotten story of how a sitting vice president, Spiro Agnew, came under investigation by federal prosecutors and, before he was forced to resign, did everything to try to stay in office, including attacking the press and trying to shut down the investigation. There are several parallels relating to current investigations into President Trump. Agnew was Richard Nixon's first vice president, and he was being investigated for bribery and extortion in 1973. At the same time, Nixon was a target of the Watergate investigation, which later led to Nixon's resignation. Rachel Maddow is the host of MSNBC's "The Rachel Maddow Show." She hosts and co-wrote Bag Man. Mike Yarvitz is a former senior producer of her show and produced and co-wrote Bag Man. As part of his research, he listened to the Nixon White House tapes and to an audio diary made by Nixon's White House chief of staff, H.R. Haldeman. Yarvitz discovered some surprising, previously unreported twists in the story, including one way that Agnew tried to get the U.S. attorney overseeing the investigation to stop it. The lead prosecutor, Barney Skolnik, never knew this part of the story until Yarvitz played him the Haldeman tape. As you hear on the podcast, Skolnik was stunned. BARNEY SKOLNIK: Well, I mean, we knew - we had some sense, as the whole country did, of what kind of administration Nixon with Haldeman and Ehrlichman and so on were running. But we had no knowledge that this was happening. GROSS: Rachel Maddow, Mike Yarvitz, welcome to FRESH AIR. Congratulations on your podcast, which has now gotten over 10 million downloads. When thinking about questions surrounding President Trump, like, did he obstruct justice; did he commit impeachable offenses; might we face a constitutional crisis, people tend to look at Richard Nixon and Watergate. But you've looked at his vice president, Spiro Agnew. What made you think about investigating Agnew? RACHEL MADDOW: For me, I feel like there are a lot of presidential scandals in U.S. history, but there are very few presidential scandals that result in resignation and/or impeachment. And I was really interested in Agnew just because he's one of that very small number of presidential or vice presidential scandals that rose to that level but also because I realized that when I tried to sort of thumbnail in my mind what happened in the Agnew resignation, everything I thought about it was wrong. All of my impressions about it (laughter) turned out to be wrong when I looked them up. And for me, that piqued my curiosity. GROSS: I was almost embarrassed listening to your podcast 'cause I knew so little. Like, I hadn't spent that much time thinking about why Agnew left office, and I was just shocked by (laughter) everything I learned. MADDOW: Well, that's not an uncommon thing, and that - what - I think Mike and I found that same dynamic at work even as we had started working on the podcast. I mean, I assumed that his big sin was tax evasion. I had assumed that it was a Watergate-adjacent scandal, you know, that the FBI was looking into Watergate-related crimes, and they stumbled upon something in Spiro Agnew's taxes. I had assumed that Agnew was kind of no big deal as a vice president because he's kind of no big deal in history. All of those things were completely wrong. The history of it is just - is not what we remember if we remember that history at all. And so it's nice to find something in history that's brand new (laughter). GROSS: Mike, before we get to what Agnew was guilty of, before we get his bribery and extortion scheme, let's just give some background. Before serving as vice president, he'd been elected the Baltimore County executive in 1962, then governor of Maryland in '66. What did Agnew represent politically when he was campaigning for vice president, when he became vice president? What did he represent on the right - because he was kind of part of the culture war in the late '60s before the term culture war was coined. MIKE YARVITZ: Yeah, I think that's right. I think one of the interesting things that we found was that he really was this sort of firebrand figure on the right in a way that Nixon really wasn't. He sort of was able to rile up the conservative base across the country. He spoke in very controversial language at times about issues of race and, you know, law and order. I think one of the sort of interesting things that's, you know, sort of not known about Agnew as a political figure is how much, in a lot of ways, he was much more beloved among the Republican base, much more so than Nixon was. What sort of manifests itself during this scandal is that Nixon really sort of needs Agnew on his side because he knows, in a way, that Agnew is much more popular with the Republican base in the country than even he is. So I think, as Rachel's alluding to, this sort of - the political history of Spiro Agnew as a political figure is sort of forgotten, but he did a lot to sort of raise these issues in the Republican base about antagonizing the media and these sort of - these racial issues that have - more sort of bubbling on the right in the '60s. And it's sort of a forgotten part of his legacy. GROSS: With the help of his speechwriter, William Safire, he said phrases like - referring to his critics - calling them pusillanimous pussyfooters. Pusillanimous means lacking courage and resolution. He called his critics nattering nabobs of negativism. And there's a great quote that you use in the podcast. He said, if you tell me that the hippies and the yippies are going to be able to do the job, I'll tell you this. They can't run a bus. They can't serve in governmental office. They can't run a lathe in a factory. All they can do is lay down in the park and sleep or kick policemen with razor blades. MADDOW: I would say he's provocative, but that attack on liberals, the attack in other instances on minorities, the attack on the elites, the attacks specifically on the media, which he really turned into an art form, is something that was key not only to his controversial nature at the time, but it's absolutely what Nixon needed in terms of lining up and keeping on his side the very hardline Republican base at the time. And I think that was part of what was interesting in terms of parallels to today. I think a lot of people lament on the right the anti-media stuff that is stoked by the Trump administration, the anti-elite stuff, some of the divisive and racially specific stuff that we're seeing from this administration. But it's not new. It's really (laughter) - it's a well-trod path, and Agnew was great at it. GROSS: Do you think Agnew kind of creates a new playbook for the kind of language you can use in campaign for high office? MADDOW: I mean, he was really quite eloquent actually in his provocative and controversial remarks (laughter). I mean, Mike, one of the things, I think - you can correct me if I'm wrong. But I feel like when we were going through his most controversial statements, one of the things that was sort of mind-bending for us - at least for me - was to be both seeing all the parallels to sort of Trumpist Republicanism today and to be seeing somebody who had this, you know, $20 million vocabulary and all the alliteration and all the eloquence. And he always spoke in complete sentences. I mean, that was kind of a disconnect for me. GROSS: So let's get to the bribery and extortion scheme that he was part of in Maryland. What was the scheme? YARVITZ: Yeah. Essentially it was a scheme that he had concocted when he was Baltimore County executive where he realized that he had the power to award some local contracts for engineering and architecture, and he could singlehandedly decide who got the contract. And what he put together was a scheme that predated his time in that office. But he would arrange with these local contractors, engineers and architects that they would get the contract. And in return, they would kick back to him something on the order of 3 to 5 percent of whatever they were making off of that contract. And these were kickbacks that were delivered to him in cash, often in an envelope that was just brought to him and handed to him directly. In many cases, he used the bag man as part of this scheme, and it was a scheme that he started when he was Baltimore County executive that he then continued when he was governor of Maryland. And again, he used a state roads commissioner when he was governor and basically, it was a kickback scheme. It was a bribery and extortion scheme in which, if you wanted a government contract in Maryland, you would have to kick back money to Spiro Agnew. And it was brazen, and it was delivered in cash. And he started that scheme in local politics, and then he carried it right into the White House. GROSS: How did it continue into the White House? YARVITZ: Well, when he was vice president, he didn't have as much power to award contracts. That's a federal process. But when he became vice president, he was still taking money for contracts that had ripened, essentially, that he had given out in Maryland as governor. And so the men who were sort of streaming into his office at the White House were paying him money for contracts they had gotten in Maryland. And in some cases, he was trying to influence the awarding of federal contracts, and he was successful in a number of cases at steering federal contracts to these businessmen in Maryland who wanted these jobs. MADDOW: There was this one great moment that we came across in the history of Agnew as a vice president where he tried to assert control over federal contracts on the Eastern Seaboard - General Services Administration contracts. He essentially decided that he was going to be, as vice president, the guy who decided who those contracts went to. And there was a sort of bewilderment about that in the Nixon White House. Why does Agnew want to do this? And they ultimately didn't let him take that over. But we can now see, knowing his criminal designs and knowing how his criminal scheme worked, that his effort to do that once he was vice president, which, again, failed, must have been an effort to get control of more contracts that he could then dole out in this kickback scheme that would earn him some cash. GROSS: Let me reintroduce you both. If you're just joining us, my guests are Rachel Maddow and producer Mike Yarvitz. They've collaborated on the podcast Bag Man, a seven-part series about the bribery and extortion scandal faced by Nixon's first vice president, Spiro Agnew. It's also about how Agnew was forced out of office. It's a story with a lot of parallels to today. We'll be right back after a break. This is FRESH AIR. GROSS: This is FRESH AIR. And if you're just joining us, my guests are Rachel Maddow and Mike Yarvitz. They've collaborated on the podcast Bag Man about the bribery and extortion scandal involving Nixon's first vice president, Spiro Agnew, and how Agnew was subsequently forced out of office. There's a lot of parallels to today. So once the Maryland federal prosecutors found out about talk of this bribery and extortion scheme involving Agnew, they wanted to investigate and see what they can find. They needed the green light from the newly appointed Attorney General Elliot Richardson. He was appointed in the spring of 1973. Richardson had already appointed a special prosecutor to investigate Watergate. So what was Richardson's reaction when he was told by his prosecutors that they wanted to investigate the vice president on bribery and extortion? MADDOW: Richardson was in an amazing situation here because he was not only the attorney general - the third Nixon attorney general at that point. The first two had resigned in Watergate-adjacent scandals of their own. He's the third Nixon attorney general. There is the special prosecutors looking into Watergate. He's responsible for that, to a certain extent, as attorney general. But he's also become a sounding board for Nixon himself. Nixon is frequently, personally calling Elliot Richardson at that point to complain about various elements of the Watergate investigation and the scandal surrounding him. And that gives Richardson an insight into the president's state of mind and how much this investigation is affecting him and distracting him and dominating his life as president. And on top of that, a totally unrelated scandal is brought to his desk from these Baltimore prosecutors, who had not started off investigating Agnew. They had just started investigating what was known to be a public corruption problem in Maryland. They did not expect that it would take them to the door of the sitting vice president, but it did. By the time they came to Richardson, they had a ton of evidence against the sitting vice president. And they were, essentially, bringing him something brand new and something potentially equally catastrophic for the White House to the Watergate scandal he was already dealing with. GROSS: So Richardson is getting pressured by Agnew, like, don't do anything about this. Richardson could have put a stop to this right there, but he didn't. YARVITZ: He could have. And that's one of the really sort of dramatic scenes that plays out in this podcast and that the prosecutors recounted for us is this July 3, 1973 meeting, where they're going to the Justice Department to meet with Richardson for the first time. And they know that they've got this sort of bombshell on their hands. They understand Watergate is going on at the time. And the consequences of this are incredible. Going into that meeting, as they recount, they don't know what Elliot Richardson is going to do. As they're laying out all of this evidence that they've collected against the sitting vice president, they're sort of looking at Elliot Richardson's face, trying to sort of calculate what he's going to do. And Richardson, during this meeting, is being called out of the room for phone calls from the White House about Watergate from Nixon, from Al Haig. And so it's incredible pressure that Elliot Richardson is under at the time, which the prosecutors are aware of. And it's not until at the end of that meeting that it becomes clear to the prosecutors that Elliot Richardson is not going to shut this investigation down. He understands the importance of it. And he, basically, gives them the green light to keep investigating and that they would keep this investigation secret, including from the White House, until such time as they needed to to sort of move forward with a more formal part of the investigation. And so Richardson, in a real way, is the person who sort of allows this investigation to sort of reach its - the conclusion that it needs to. GROSS: What are some of the smaller ways of attacking the people who were investigating him? MADDOW: One of the first signs that the Baltimore prosecutors had that they were maybe onto something big that related to the vice president is that when Agnew heard that there was an investigation going on into public corruption in Baltimore County back in Maryland, he (laughter) made himself available to the attorney general. He sort of importuned himself into the scandal himself, even before he had ever been named in conjunction with it - actually, even before the attorney general knew that this investigation was going on. It hadn't risen to the level where the attorney general himself would be notified. So Agnew had his antenna up and knew that this was something that could get him in trouble. And so he got himself more in trouble by raising his hand and saying, hey. Mr. Attorney General, this investigation - this needs to stop. That was sort of prosecutors' first sign that maybe he was involved in it. That was not a genius move on Agnew's part. But then he continued efforts through the attorney general directly and, ultimately, through the U.S. attorney who was supervising the investigation in Maryland, to pressure them into stopping the investigation simply because Agnew thought they should. YARVITZ: And one of the things that's interesting to see in terms of that strategy that Rachel's talking about is his effort to sort of behind-the-scenes cast these federal prosecutors as biased. He's sort of making an effort within the White House to say that these prosecutors are unprofessional and that they have political vendettas against him. And so as part of this obstruction effort, he is trying to sort of malign the character of the prosecutors who were in the process of investigating him. GROSS: That has a familiar ring to it. GROSS: So you found something, Mike, that the prosecutors didn't even know at the time. And that - this was - there was a secret plan that Agnew had to shut down the investigation. Would you describe that secret plan? YARVITZ: Yeah. You know, it's - an interesting part of us digging into this story was looking through the Nixon White House Recordings. And obviously, those recordings have been very picked over as it relates to Watergate but not as picked over as it relates to the Agnew scandal. And what we found as we were sort of listening through the recordings was this effort that Spiro Agnew developed behind the scenes with Richard Nixon and with H.R. Haldeman and other White House officials to try to shut down this investigation that was being led by the U.S. attorney in Maryland - a man named George Beall. And the way that Agnew tried to do it was by getting to George Beall's brother, who was a sitting Republican senator from Maryland named Glenn Beall. And what you hear in these tapes is this really elaborate plan that Spiro Agnew is discussing in the Oval Office with Richard Nixon and others to, basically, get to this Republican senator behind the scenes and have him, essentially, get word to his brother to shut down this investigation. And as you mentioned, this was an obstruction effort that the prosecutors at the time didn't know about. And one of the surprising and amazing things to us as we were putting together this podcast was that even 45 years later, they weren't aware of it. And so their reaction now to hearing about this effort to obstruct and end their investigation, it was a revelatory moment in putting together this podcast, which is that they were completely unaware. And the reason that they weren't is because ultimately, the obstruction effort didn't work. And George Beall, their boss, the U.S. attorney, was getting that pressure from his brother. And he shut it down. He didn't let it get to his federal prosecutors who were working on the case. GROSS: He shut down the attempt to shut down the investigation (laughter). YARVITZ: That's right. That's right. YARVITZ: He resisted that pressure that was coming at him from the Nixon White House and from his brother. GROSS: OK. In case anybody is finding the story hard to follow - so George Beall is the federal prosecutor in Maryland overseeing the investigation into Agnew. His brother is a Republican sitting-senator from Maryland, who's getting pressured from the White House. So the senator's being pressured to tell his brother, the prosecutor, shut it down. And - yeah. MADDOW: The other nice dynamic at work there is that George Beall's older brother, the U.S. senator, he really owed his Senate seat to Nixon and Agnew. 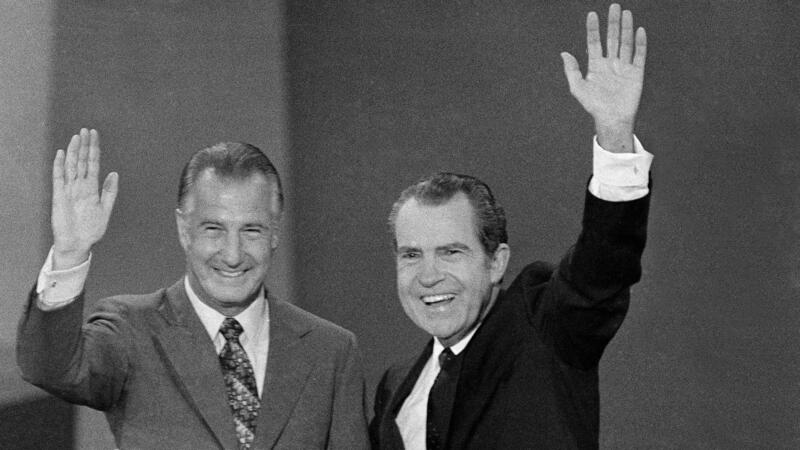 Nixon and Agnew had weighed in very heavily during his election campaign to help him win that seat. George and Glenn, the brothers, their father had previously held that U.S. Senate seat. He had been ousted by a Democrat. Nixon and Agnew in the White House weighed in to help the Beall family, to help George Beall's older brother win that seat back that their father had previously held. The Beall family was absolutely indebted to the Nixon White House, to Agnew, personally, because he campaigned for that Senate seat as a big figure in Maryland politics for them to win it. And so for then little brother George Beall to turn around and bring a prosecution against Agnew when his family was so politically and personally indebted to Agnew and when Agnew was reminding them of that at every turn and bringing all of these different Republican graybeards and important people to weigh in to try to pressure this investigation to stop - I mean, George Beall was a heroic figure here in the way that he resisted the pressure that was brought against him. GROSS: My guests are Rachel Maddow and Mike Yarvitz, who collaborated on the podcast Bag Man, a seven-part series about the bribery and extortion investigation into Vice President Spiro Agnew and how it forced his resignation. Maddow hosts MSNBC's "The Rachel Maddow Show." Yarvitz is a former senior producer of the show. After a break, we'll talk about how George H.W. Bush figures into Agnew's attempt to stop the investigation. And we'll talk about lessons from the Agnew story that may be relevant to the investigations into Donald Trump. I'm Terry Gross. And this is FRESH AIR. GROSS: This is FRESH AIR. I'm Terry Gross. Let's get back to my interview with Rachel Maddow and Mike Yarvitz about their podcast Bag Man, a seven-episode series about the federal investigation into Nixon's first vice president, Spiro Agnew. Federal investigators in Baltimore found evidence that Agnew was involved with bribery and extortion while he was Baltimore County executive and governor of Maryland. And he continued to collect money while he was vice president. Agnew was forced to resign in October 1973, while Nixon remained under investigation for Watergate. The podcast reveals new surprise twists in the story. Rachel Maddow co-wrote and hosts Bag Man. Mike Yarvitz co-wrote and produced the series. She's the host of MSNBC's "The Rachel Maddow Show." Yarvitz is a former senior producer of her show. When we left off, we were talking about the plan Agnew developed with Nixon and Nixon's chief of staff, H.R. Haldeman, to try to stop the investigation into Agnew by telling Glenn Beall, a sitting Republican senator from Baltimore, to get his brother George Beall, the U.S. attorney in Maryland overseeing the investigation, to shut it down. There were many surprises for me in listening to your podcast, Bag Man. Perhaps the biggest was hearing - and I'll set the scene here. I was listening to this particular episode of the podcast not long after George H.W. Bush's funeral. And there was a kind of - a whole week of the news networks, basically, talking most of the time about George H.W. Bush's presidency, what a model president he was. And suddenly, his name crops up in your podcast about the Agnew bribery and extortion scheme and the attempt to shut down the investigation. Tell us how George H.W. Bush comes up in this. MADDOW: So when Agnew and the Nixon White House were trying to put together a scheme to shut down this prosecution of Agnew, they lit on this idea that the U.S. attorney in Maryland who was leading the investigation - that he could be pressured through his family to stop this thing. So the White House needed somebody to put that pressure on him. Nixon says on tape that he's not going to do it himself (laughter), and so Nixon's staff is like, oh, no, no. Sir, of course you can't do that yourself. It seems like Agnew did a little bit of it himself. There was a lot of discussion about different senior White House figures being asked to go put that pressure on that senator. But ultimately, for a variety of reasons, the person - or one of the persons who they decided to dispatch to pressure that senator to try to shut down that investigation was the then head of the Republican National Committee, the head of the Republican Party, who was George H.W. Bush. GROSS: So we know that he actually went to the senator's office to try to get him to pressure his brother to stop the investigation. But do we really know what he said? We know he had the meetings, but I was wondering, like, did H.W. Bush go to the senator and say, I was told to tell you this. I'm telling you this. I'm not telling you to do it. I'm just telling you I was told to tell you this. I've told you this. Goodbye. And thank you. GROSS: Do you know what I mean? GROSS: ...Doing my job. I'm telling you, but I'm not pressuring you. I'm just reporting what they told me to tell you in a neutral way. MADDOW: It's - you know, we don't have a - we don't have a recording of what happened between George H.W. Bush and this Republican senator. But, I mean, Mike was able to turn up pretty good evidence on both sides of the request and what was apparently the delivery of the pressure by George H.W. Bush. So we at least can see some of the documentation of it, right? YARVITZ: That's - yeah, that's right. We can hear, obviously, the White House tapes where Al Haig is informing President Nixon that he's - you know, he says, I did it through George Bush on the first run, meaning I spoke to George Bush and told him to deliver this message to the senator to get through to his brother. And so we know, from that end, that Al Haig and Richard Nixon oversaw this effort to have George Bush do that. And one of the things that we found in reporting of this story was the trip that I took to George Beall's archives at Frostburg State University in Maryland, where he wrote a memo to file that lives in his archives in which he memorializes, for the record, the fact that his brother - the sitting Republican senator Glenn Beall - did relay a conversation that was had with him by George Bush. And we don't know the exact nature of the conversation, but it was part of this effort from Agnew to say that these prosecutors were intimidating people and were conducting this investigation in an unprofessional manner. And we can see in this memo - the file from that summer of 1973 - that George H.W. Bush, who was then Republican Party chairman, did speak to the Republican senator there to try to get word to his brother about this investigation. GROSS: You also have on tape Agnew saying, get this thing - the investigation - get this thing over with, and get this guy Skolnik - one of the prosecutors - who's a Muskie volunteer, the hell out of his office. Where did you find that statement? GROSS: Until you played it for him. YARVITZ: Until we played it for him. And it was something that he had not known. And again, it's a credit to his boss at the time, George Beall, that he that he didn't know that because that pressure, those efforts to get him thrown off the case - they never sort of got through to him. And so, in a real way, these federal prosecutors - and they say it - they were just doing their job. They were not looking for any fame out of this or anything like that. But I think when Barney Skolnik was able to see on tape that part of the obstruction effort was to get him fired, essentially, off the case, that was a surprising moment that we were able to sort of reveal to him for this - for the series. GROSS: So let's play some of prosecutor Barney Skolnik's reaction when you played that tape for him. SPIRO AGNEW: Get this thing over with, and get this guy Skolnik, who's a Muskie volunteer, the hell out of his office. SKOLNIK: Oh, there's my name. Wow. Agnew said my name. Oh, joy. Get this thing over with, and get this guy Skolnik, who's a Muskie volunteer, the hell out of this office. Oh, man. You got to give me a copy of this. SKOLNIK: Oh, wow - makes my whole life worthwhile (laughter). GROSS: So that was prosecutor Barney Skolnik in a moment from the podcast Bag Man. If you're just joining us, my guests are Rachel Maddow and Mike Yarvitz. They collaborated on the podcast Bag Man about the bribery and extortion scandal surrounding Nixon's first vice president, Spiro Agnew, and how Agnew was subsequently forced out of office. It's a story with a lot of parallels to today. We'll be right back after a break. This is FRESH AIR. GROSS: This is FRESH AIR, and if you're just joining us, my guests are Rachel Maddow and Mike Yarvitz. He produced, they cowrote, and Rachel hosts the podcast Bag Man, which is a limited series about the bribery and extortion scandal involving Nixon's first vice president, Spiro Agnew, and how Agnew was subsequently forced out of office. So once prosecutors understood Agnew's involvement in this bribery and extortion scandal, we had a president under criminal investigation - Richard Nixon, Watergate - and now a vice president under a completely separate criminal investigation. What was the unique set of problems that this presented for prosecutors? MADDOW: Prosecutors, at the time, I think were already - well, prosecutors writ large. I think the Justice Department, the attorney general, Elliot Richardson, at the time, was already faced with the enormity of the prospect that the Watergate investigation would lead to the end of the Nixon presidency, whether he was somehow prosecuted, whether he resigned, whether the pressures of the Watergate investigation were somehow going to end his presidency one way or another. That was already such an almost, you know, sort of politically apocalyptic scenario that they were facing. They were blindsided when they were confronted by the evidence that Agnew was also existentially challenged as a senior figure in the federal government because of his own totally unrelated scandal. And the prospect that you would lose Nixon somehow, that Nixon would have to leave the presidency but then Agnew would ascend to the presidency because he was the vice president even though the Justice Department was well aware that he was under serious criminal investigation - he was potentially facing a 40-count criminal indictment - that I think was a terrifying and totally unique prospect in U.S. history. I mean, theoretically, what that could have resulted in is Nixon leaving office - or being forced from office because of the criminal scandal that was Watergate - him being succeeded immediately by a vice president who was under a completely separate criminal investigation who was then also forced from office relatively quickly because of that same sort of criminal liability that his predecessor had faced. At that point, would President Agnew have even had a chance to nominate a new vice president who would then be confirmed by the Senate who would then succeed him? Would you end up with a Democratic speaker of the House ascending to the presidency because all of these dominoes were falling too quickly for the line of succession to be restored fully? I mean, the prospect of the chaos at the top of the federal government was just unparalleled. GROSS: And the fear of that kind of chaos drove the prosecutors' approach to dealing with Agnew. Would you explain how? MADDOW: Well, the prosecutors themselves, the - these young prosecutors in Baltimore who actually put together all the evidence that nailed Agnew, that really had this - they built a slam dunk case against him. They wanted Agnew to go to jail. They wanted Agnew to be treated like a public official on the take, somebody who'd been caught for public corruption and had to pay for it. It was Elliot Richardson, the attorney general, who decided that the priority could not be individual justice for Spiro Agnew, the criminal. The priority could not be Agnew being put in jail. It was Richardson who decided that the priority for the country had to be Agnew out of the line of succession, that the most important and in fact the unitary goal of this prosecution, of this entire revelation these prosecutors had come to about Agnew, the unitary goal of it had to be his removal from office. He had to no longer be vice president because that was more important to the country than whether or not he faced individual justice. The prosecutors were very mad about it at the time, but Richardson believed it was the right thing to do. GROSS: So what was Richardson's approach to removing Agnew from office? MADDOW: Well, Richardson and his prosecutors engaged in a lengthy series of negotiations with Agnew's own legal team about what they were going to do with this evidence of criminal behavior on the part of the vice president. And this is, to me, is where you get into some of the most important and fuzzy (laughter) implications of the end of Agnew as vice president of the United States because the Agnew legal team was maintaining publicly that Agnew as vice president was immune from prosecution, that he couldn't be indicted. The Office of Legal Counsel, the Justice Department at the time, was asked to weigh in on this matter. And they produced a sort of strange memo, which said, well, the president can't be indicted, but the vice president can - sort of an odd duck that memo. But on the basis of that opinion, the attorney general and these prosecutors went to Agnew's legal team and said, hey, we can indict you, and we intend to, and what do you have to trade for that? And those negotiations went on for a long time. And they were complex and important, but, ultimately, the deal that was reached was that Agnew would only have to plead no contest to one count. He wouldn't do any jail time, but he would have to resign immediately. GROSS: And what was the count that he pled to? MADDOW: He pled to tax evasion, but he didn't plead guilty. He pled no contest. MADDOW: They think - yeah, oh, he got caught fiddling something with his deductions - no (laughter). GROSS: And it was such a bigger story. YARVITZ: Yeah. And in a way, that is a credit to Spiro Agnew's defense attorneys, who were able to secure in exchange for his immediate resignation from office this plea to a single count of tax evasion in a single year. And so, you know, when you look back at the history of Spiro Agnew just doing sort of a cursory search of it, that's what you find is that, you know, Vice President Spiro Agnew resigned on account of tax evasion. But it was a very drawn out process between Agnew's defense lawyers and Attorney General Elliot Richardson really negotiating this agreement that would result in one count of tax evasion. GROSS: So one of the questions surrounding President Trump now, a question that surrounded President Nixon and Vice President Agnew, is can a sitting president be indicted on criminal charges - or, in Agnew's case, a sitting vice president? Does the Agnew story that you've told so well in Bag Man have any lessons for us today that can help answer that question? MADDOW: I think that there are puzzles on both sides of this. If Agnew's defense team and if Agnew himself didn't believe that a vice president could be indicted, which is what they maintained and argued publicly at the time, well, then why did they talk to prosecutors at all? They were maintaining a public argument that prosecutors essentially had no power over a sitting president or vice president. They couldn't touch him. Well, if so, why did they even talk to those prosecutors, let alone enter into a plea negotiation with them that resulted in the vice president's resignation? On the other side, prosecutors were claiming that they could indict a sitting vice president and they were fully willing to. Well, if so, if they were confident in that, then why did they go through this choreography? Why did they take such pains to ensure that by the time Agnew pled to that tax evasion count, by the time he was in that courtroom, he had resigned first? I mean, he resigned moments before he stepped into that courthouse. And they made sure that was the sequence of events. Had he resigned as vice president moments after he pled or after he was indicted, we would have an entirely separate legal precedent on this case - that a president or vice president could be indicted. In this case, they sidestepped that issue by allowing him to resign first. MADDOW: I'm - and I'm still puzzled as to whether or not they were bluffing, that they weren't totally sure they could indict him - or what would have happened had that Justice Department opinion that said he could be indicted actually been tested in court? They sidestepped the test by letting him resign first. GROSS: My guests are Rachel Maddow and Mike Yarvitz, who collaborated on the podcast Bag Man, which tells the story of the federal investigation into allegations that Spiro Agnew received payments from bribery and extortion. Rachel Maddow host the series. We'll talk more after a break. This is FRESH AIR. GROSS: This is FRESH AIR. Let's get back to my interview with Rachel Maddow, host of MSNBC's "The Rachel Maddow Show," and Mike Yarvitz, a former senior producer of the show. They collaborated on the podcast Bag Man, which Maddow hosts. It's about the federal investigation into bribery and extortion allegations against Spiro Agnew, which forced him to resign as Nixon's vice president. So let's just get a sense of what chaos our government was in in October of 1973. Agnew resigns, and then 10 days later, what happens? MADDOW: Ten days later is the Saturday Night Massacre. I mean, it's amazing. It's not even two weeks later that Nixon orders the attorney general to fire the special prosecutor, who is pursuing the Watergate case. That attorney general, of course, is Elliot Richardson, the man who just secured the resignation of Nixon's vice president. Richardson objected to that order from the president. He resigned in protest, deputy attorney general then resigned in protest. Ultimately, it went down down the line of succession at the Justice Department until the solicitor general, Robert Bork, was willing to fire the Watergate prosecutor. That all happened within two weeks of Agnew - surprise - being forced from office in this dramatic showdown in a courtroom in Maryland. And I actually think that the closeness of those two events in the timeline is part of the reason that the Agnew story is so poorly understood. I mean, Watergate was at a full, roiling boil by the time Agnew was going through this entirely separate drama. And the history of Elliot Richardson is very much inflected by the heroic way in which he resisted Nixon's order and resigned on that Saturday Night Massacre - in the middle of that Saturday Night Massacre drama. But that was so close in time to what he had done with Agnew that I sort of feel like we've got limited bandwidth as Americans (laughter) in terms of our history books. We can only remember so many events from one particular time in history. And so Agnew ended up slinking into the shadows on that one. GROSS: Yeah. So Elliot Richardson, the then-attorney general, was so important in bringing down Vice President Agnew and in the Watergate investigation. Now we have an acting attorney general who actively supports President Trump. And President Trump is under investigation. And we have a nominee to be the attorney general who opposes the Mueller investigation. So we're in a very different situation right now. MADDOW: Yeah. It's interesting to see the, I guess, the strength of the Justice Department through various lenses of history. I mean, the Justice Department has rules. It has its own traditions. It has its own pride and its own independence and competence. It's also an institution that is run by human beings who have different strengths and weaknesses and alliances that they bring with them to their jobs. And part of the story of Agnew is the heroism of George Beall, this Republican U.S. attorney, age all of 35, who supervised this investigation and resisted all this pressure that was being put on him by the most powerful people in the country, in his family and in his own party. Part of the story of Agnew is the statesmanship of Elliot Richardson and the way that he approached this and the way that he prioritized the needs of the country over the individual concerns of his own prosecutors and the individual sort of imperatives of this criminal case that he was dealing with involving Agnew. And you have to wonder, if people of that caliber were not in those powerful positions at that important time, would we have had a different outcome for the country? Would we have had President Agnew? GROSS: Rachel, you retweeted presidential historian Michael Beschloss' tweet. You did this on Tuesday of this week, and it's very relevant to the conversation that we're having. Beschloss tweeted - Nixon on Watergate in State of the Union 45 five years ago this month. Quote, "I believe the time has come to bring that investigation and the other investigations of this matter to an end. One year of Watergate is enough - exclamation point." That sounds familiar. MADDOW: Yeah. It is amazing how much the history rhymes here. I mean, we don't do anything exactly twice. But the parallels with what was going on in the Nixon and Agnew administration 45 years ago to the efforts by the Trump administration right now to parry this investigation and these swirling scandals around this presidency - it is uncanny. The attacks on the press, the attacks on the Justice Department, the efforts to undermine the independence of the Justice Department, the attacks on individual prosecutors, the effort to claim publicly that there's something improper about the length of the investigation - all of these things have direct parallels in the Agnew scandal and in Watergate. And we know how it ended, both for Nixon and Agnew, but that doesn't mean it's going to necessarily end the same way now. History is informative but not determinative in terms of what happens next. I do feel like it helps to understand that even though it feels like a lot of what we're going through is unprecedented or worse than we can possibly imagine, the more you know about previous scandals in U.S. history, the more you realize that some of this stuff is not unprecedented and that we have not only been confronted with some of these same problems and crises in the past, we've survived them and done so in a way that we can be proud of in terms of the way that our democracy handled challenges. And Agnew's case, because of some heroic individuals and because the system held and because of, you know, some historical accidents in terms of the way things worked out - I think the Agnew story is really helpful to understanding the way the system works when it confronts bad behavior by people in high office. We are capable of dealing with that as a country in a way that makes us proud of the people who are in public office who are dealing with it. GROSS: I just want to say in conclusion to our listeners, we just touched on some of the story that's told on Bag Man. There's a lot more story in it and really interesting clips as well. So the podcast is called Bag Man, and my guest Rachel Maddow cowrote it with Mike Yarvitz, the producer of the podcast. And, Rachel, of course, also hosts her own show on MSNBC weekday nights at 9 o'clock. Thank you both so much for talking with us. MADDOW: Terry, thank you so much. This was a ton of fun. Thank you. YARVITZ: Thanks, Terry. It was an honor. GROSS: Tomorrow on FRESH AIR, my guest will be Kevin Hart, whose stand-up comedy sells out stadiums. He stars with Bryan Cranston in the new movie "The Upside." Last month, Hart stepped down from hosting this year's Oscars after facing criticism for earlier homophobic jokes and tweets. The story is still developing. I hope you'll join us.